Won’t it be great if you carry a marine cooler with you while you are heading out on the open water? Best marine cooler ensures your foods are stored well, and they maintain their quality during the journey. It doesn’t matter whether you are going fishing or intend to enjoy the company of your family in the ocean. A good marine cooler will let you have the luxury of ensuring your beverages and food are kept well and frozen. Actually good marine coolers will give you the opportunity of having the best ice retention facility. 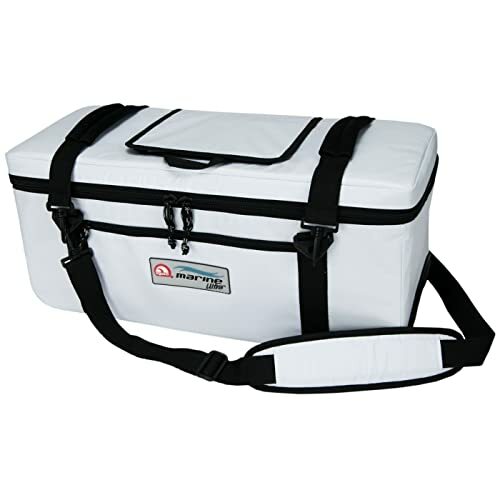 When you are on fishing, the best cooler will ensure you fishes are fresh until you go back to your home. Trips in the ocean sometimes might be lengthy, and you have to make sure that you are carrying the best marine cooler in the market. 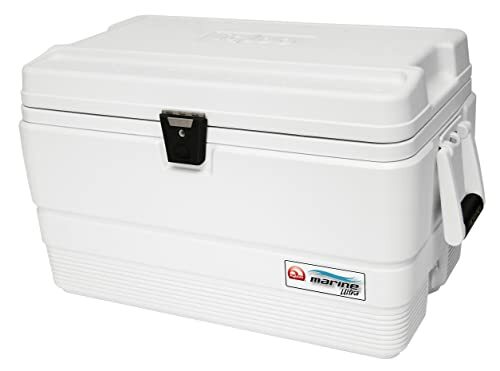 Because the best marine cooler will always have features like ice retention system for a long time, UV resistance, leak-proof, easy-to-carry and many more. Well, it is a tough job to search for a marine cooler in the market. There are lots of brands and products. It will be difficult for you to find the best one. So, today, after several types of research we made a list of top marine coolers that are worth buying. Here are the products below with the necessary details. If you are looking for a marine cooler that is large in size and eco-friendly, then you are suggested to buy this cooler. 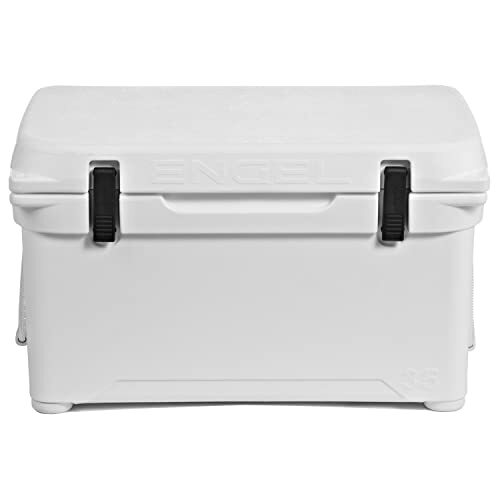 This cooler is ideal for boating trips. People who go out for fishing are really fond of coolers with great portability facility. 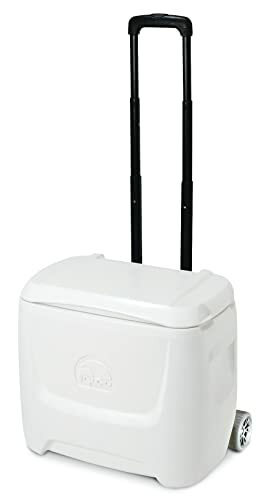 This cooler is portable and has many facilities. This product can hold up almost 200 cans. Ice retention facility is awesome. This product gives almost six days of ice retention facility. This is quite enough for common trips. The product is also leak resistant too. Stainless steel is used to make this product. So, even after using for a long time, you won’t have to worry about the stain issue. Sun protection facility is another addition that makes this product durable. That is why, whenever you wish for a cooler that can be used roughly for many years without facing a problem, you will be suggested this product. Insulation of CO2 in a low range makes this product eco-friendly. The product has 120 quarts inside. 6 days full ice retention facility is provided by insulated lid and walls. The hardware of this product is made of stainless steel. Cup holders and side handles are built in. The handles of this product are not much durable. You have to be careful holding the handles. The top of the product is a sensitive part. It might dent in if you put heavy things on it. This product is perfect for any kinds of trip. It doesn’t matter if you are going on hunting, camping, picnic, fishing or anything else, you can carry this product with you easily. As the size and structure of this product is pretty much compact and decent, you won’t have a problem carrying this. Adjustable shoulder straps will always help you to carry the product firmly. You can use this product to keep things warm on your journey too. You will find a side pocket integrated. This pocket can be used to carry dry items separately. When it comes to sweating and leakage issue, the product has no such record. The manufacturer guarantees that you will not find any leakage in the product. It won’t sweat at all. This product can hold ice for almost a day. Because the leak-proof liner system is built very nicely. The product is a soft-sided cooler. Eligible for all types of parties and outdoor trips. Has the ability to hold ice for 24 hours in 120 degrees Fahrenheit temperature. A side pocket is integrated for carrying dry things separately. Leak-proof liner system is integrated. Adjustable shoulder straps help you to carry the product easily. Handles will become frayed after using the product consistently in rough situations. Buckles are made of cheap material. Igloo is a company that rarely disappoints a customer. Igloo’s Quick and Cool cooler is a product that can perform very well and satisfy most of the users. Manufacturers didn’t compromise on the material. The product is made of quality material. Body and lid of this product have a very good structure. That is the reason why you can use this product for a quite long time. The easy draining system of this product lets the stuff inside stay good. The threaded drain plug is the reason behind this feature. The lid closure of this product is safe and secure. Odor issues are not present here. Stain and odor resistant liner helps your food to stay fresh and good. Insulated body and lid of this product are capable of keeping ice for about one week at 90 degrees Fahrenheit. The quick access hatch is another user-friendly part of this product. it lets you access your food without the escape of cold air. Polyethylene is used here. The material makes this product strong enough to perform well. Body and lid of this product are Ultratherm insulated. It helps to hold ice for several days. Integration of swing-up handles makes this product easy-to-carry. The threaded draining plug is integrated for easy draining. Stain and odor resistant liner is integrated for keeping the food inside fresh. The handles are made cheaply. They are not durable enough. The construction inside of this product is not good enough to stand strong in the toughest situations. You will get almost every type of the feature inside this product. From material to portability, this product barely has any negative side. 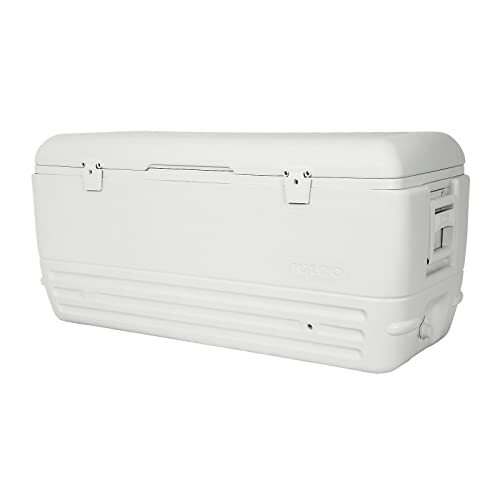 Both the body and lid of this marine cooler is constructed nicely. You can expect this product to perform perfectly for more than a few years. You can depend on the product’s insulation system. 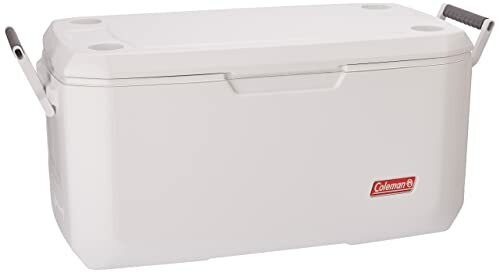 As far as the food is concerned, your food will remain fresh and healthy inside this cooler. Odor resistance system of this product performs well. The product also has no bad smell that can put negative effects on food inside. Stain resistant liner is very much useful. The product makes sure that you don’t face any stain issues for a long time. Not just stain and odor, UV rays will also fail to put impact. The structure of this product doesn’t let UV rays obstacle the product to perform its best. There is a measuring ruler on the lid to measure fishes. The body of this product is Ultratherm insulated. This makes the product one of the best performers. Stain and odor resistant liner are integrated so that both food and the product stay fine. UV protection shield is integrated to prevent sun damages. Capable of providing the easy-to-drain facility. Handles of this product have reinforced comfort grips. The lid is the weakest part as it is not insulated. 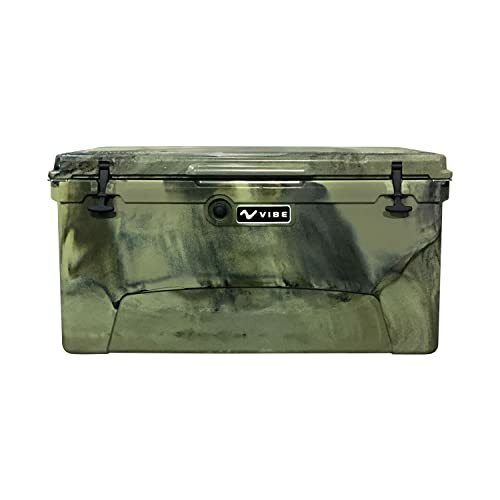 This Tundra 45 cooler has one the finest insulation systems in the market. The insulation wall of this product is thicker and stronger than other similar products on the market. With more than 3 inches of thickness, this product is certified as bear resistant. The construction doesn’t allow the product to get damage easily. You can carry this anywhere without any doubt. Camping, fishing or whatever the trip is, it will perform its best. The cooler is portable. You can carry this product along with other stuff without any hesitation. Let’s not forget about the lid. We all know that Yeti always makes good lid construction. 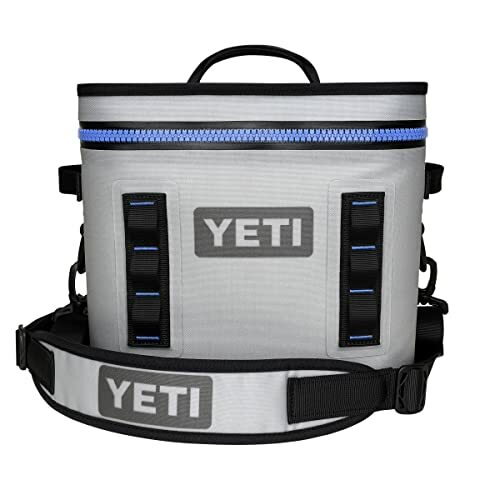 Like other Yeti’s Tundra products, this product has a lid that has T- Rex latches. T-rex lid latches are made of rubber that performs amazingly well. The patented technology is used to make the latches so that you never see a damaged latch so early. Has the capacity of holding 26 cans including ice. Walls are more than three inches thick with two inches of the insulation system. Makes this product bear resistant. Construction is sturdy and capable of surviving in any kinds of situation. T-rex lid latches are made of strong and durable rubber. Leak-proof and easy draining system is integrated. Though this product is strong, they are heavy too. Drain plug will leak when it will become older. Durable construction is the best part of Vibe Kayaks’ this product. You will find the construction of this product strong enough not to get damaged easily. Ice retention system of this product is awesome. It can retain ice for about 5 days. Insulated walls of this product keep your food fresh and good for a long period of time. So, you can have a nice appetite for your journey on the water. The freezer style lid gasket is one of the products positive sides. The handles of this product are very much comfortable to hold. So you can carry them easily without getting an injury to your hands. The feet of this product is made of rubber. So, the product won’t slip at all. Bottle openers are this product’s extra feature. The locking system integrated here is safe and durable. So, you don’t have to concern for any leakage issues too. One piece rotomolded construction of this product is strong enough to provide you service for a long time. Pressure release valve is integrated. Heavy-duty handles with the padded system are comfortable to hold. Rubber feet with the non-skid facility is awesome and make the product stay where you left. Molded tie down slot integrated. This product will be unable to hold ice when it will become old. The drain plug might also leak after a few months. You will have to repair it then. Igloo always makes products that are capable of performing highly. The product now we are discussing is pretty much compact and strong. You might know that transportation is a matter that you should think before buying a marine cooler. This product can be carried easily carried on any trip. The handle of this product has a strong structure. This helps you to pull the product easily and move this from one place to another. The handle used in this product is called Telescoping handle. The duo of the wheel is well made. These wheels are smooth and strong. These wheels don’t put a mark on the boat surfaces. If you take a good look inside this product, you will be able to know that this product can perform much better than other similar ones when the subject is cooling the food and other stuff inside. Polypropylene is used to make this product. The telescoping handle has a push button and locking system. Sport rally wheels don’t put a mark on the surface at all. Side scoop handles help you to load and unload very easily. Hollow divider inside lets your foods stay cool and fresh. This product doesn’t have any drain plug. This cooler has a chemical odor that might disturb you. This product is for those who wish for a soft compact cooler bag which can hold cold for a long period of time. Many users find the zipper system quite useless. But this product is different. It has a leak-proof zipper system. This feature allows the product to give you great ice retention facility. You can definitely use this product to carry foods and beverages with you including ice. So, you can enjoy chilled drinks outside in hot summer. This product also has a water resistance system. This feature allows you to carry this product for fishing trips even on rainy days. As this product is water resistant, you can be sure that this product won’t sweat from the outside. Weather will also be unable to put effects on your stuff inside. Wide mouth opening is very much important. When you open the product, you can easily get access to your food. Size is very much compact. You can use this for any kind of outdoor trips. Fully leak-proof cooler. So, your items will stay good inside this cooler. The high-density fabric is used to make this product. The fabric makes this product waterproof. Closed-cell rubber foams can hold temperature for a long period of time. Has the capacity of holding 12 cans including ice inside. The product does hold cold for a long time. But not as much as other similar products. The rubber casing around zipper is not constructed well enough. The product is a very special cooler bag. Not like other bags, this cooler bag is very much durable. It is capable of taking offenses rapidly. 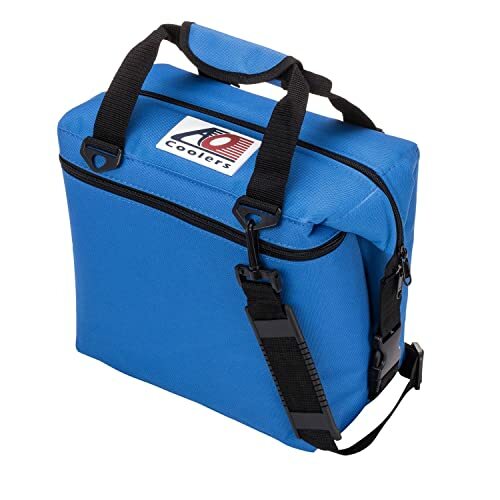 So whenever you are looking for a cooler bag that can provide you chilled food and help you carrying ice, you can buy this one. This product leak resistance system that lasts longer. So, your food and ice will remain chilled inside. You can store food inside for a long period of time. It has the ability to keep your food good enough. This product is very much easy to clean. If your bag gets dirty coincidently, then you can clean this up within a short period of time. Because of this, you can use this bag in any conditions. Let’s not forget about the UV protection. This UV protective bag doesn’t allow UV rays to put negative effects on your food inside. Durable and anti-mildew cooler bag. Easy to clean. Eligible for use in many types of situation. Non-corrosive hardware is used to make the product. Survives harsh situations without getting any damage. Odor and leak resistant system help you store your food safely for a long period of time. The only problem is the stitching that joins straps with the main product is not durable. An ideal product if you wish for a long time ice retention facility. When you and your mates are going out of home for more than a week, you should use this product. Apart from ice retention facility, the overall performance of this product is satisfying. The structure and construction of the product are strong enough. So, durability is guaranteed. You can rely on this product for several years. To reach your satisfactory level, the manufacturer also provides a warranty for this product. This is a certified cooler. IGBC certified this product as a bear-resistant cooler. There are two pretty strong locks included. So you don’t have to worry about the food inside this product at all. There is another thing you should know about this product’s construction. The construction of this product is ultra Violate ray resistant. Not just food, you can also carry dry ice inside this cooler. 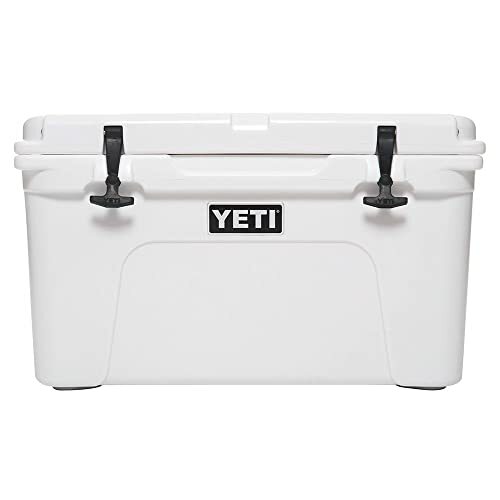 This cooler is capable of storing ice for many days. Capable of keeping food and drinks iced for maximum 10 days. Eligible for fishing, paddling and camping trips. The product contains a TruHold lid which is strong and doesn’t get damaged easily. Stainless steel materials are used to make Unity Latch System. The locking system is strong enough and keeps your food safe from animal issues. The product is heavier than similar coolers in the market. You can find difficulty carrying this. There is not enough room according to the structure. There should be more space. A good marine cooler is a product that can provide you service for a long time. When you buy a good marine cooler, you can have so many facilities that can help you enjoy an exciting and fascinating time on the water. If you buy the best marine cooler, then you can carry that one in any kind of trip outside your home. Apart from ice retention facility, you can have a lot more than you imagine for several years. It is suggested that a buyer should think a lot before buying a marine cooler. Because cooler is not the product that you have to buy frequently. And to reduce your problem, we already did some researches and represented top cooler. So, if you buy one from the list above, you can have almost every single facility that the best marine cooler can provide.